This is written for the Delta 36-725 Contractor saw but it is reasonable to think that the thoughts and methods described here would work on other saws. This is a fairly new design release and, as such, options/accessories have not yet been designed by the manufacturer. I made a ZC throat plate for my new saw out of ½ oak ply. Unfortunately, I had unexpected problems due to the riving knife and anti-kickback pawls being a part of the saw rather than a part of the blade guard assembly as in my old saw. Everything operated just fine except when lowering the blade. The teeth on the pawls would bite into the oak and push down on the plate rather than simply riding backwards as normally happens on the metal plate. (Pic 3 above) I had to remember to hold the pawls up with my left hand while I cranked the blade down with my right. Repeated annoyance. I am aware that others have experienced a similar situation with other saws and that the normal fix is to file the points down on the pawls. I may elect to do that for other reasons, like not leaving marks on the thin veneer on today’s sheet stock. But I was not going to do that for this problem. Another personal issue was that I like the plate that came with the saw. Heavy steel. Nice chromed plate where the pawls ride. It was bent slightly out of the box but a bit of tweaking fixed that easy enough. What I did was make a zero clearance plug for the existing steel plate. No flex. It can be removed/changed at will. Works great. This describes how I made it using the router and table saw. I found some “metric” ½ ply (just shy of ½”). I know this stuff is tough. It is used for flooring in boats. In reality, I think the exotic wood we all have called “whatchewgot” works well. This ZC plug will have a ½-inch wide flange that fits underneath the plate. It clears everything inside the saw, including the blade arbor nut flanges. The first step was to put a ½-inch straight bit in the router and set the depth to the thickness of the metal throat plate. Then set and clamp a straightedge to use as a guide for the router. 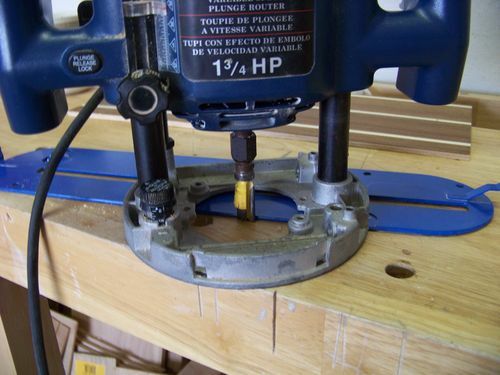 Measure the length of the saw slot and draw reference lines on the plywood. As you rout you will run the router past these lines. 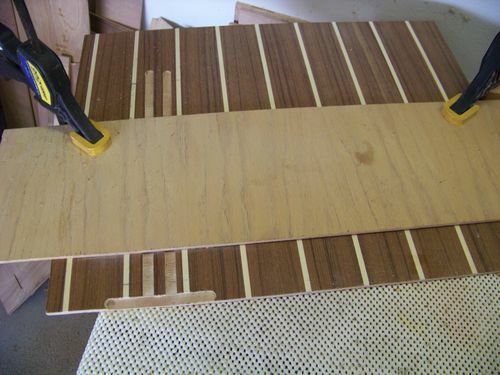 Rout the first ½-inch dado. 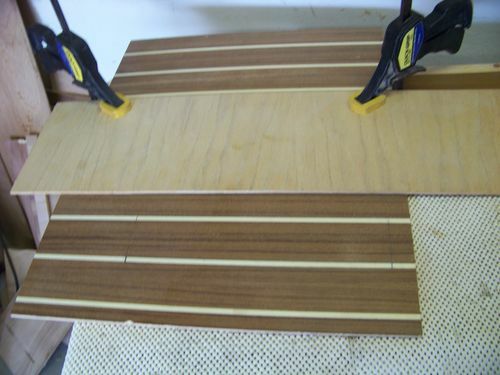 Now move the straightedge router guide to make the 2nd dado. The bit is ½-inch wide and the slot in the plate is just shy of ½-inch (metric ½-inch). 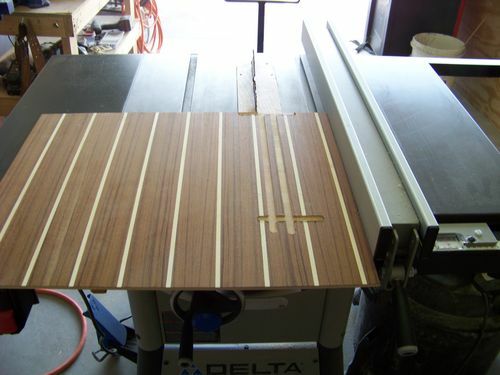 Add these 2 measurements together and move the straight edge router guide that much. A note here about how I work. I want this thing to fit snugly in the plate slot so I rout very slightly over size. I know that slicing with a razor knife along a straightedge later will get me a perfect fit and is not at all difficult. I don’t make a living at woodworking and don’t have dial indicator fixtures and such but I can take a minute to trim. Set the straightedge and rout the 2nd dado. The next step is to rout one end of the ZC plug. Set the straightedge to run the router right along the edge cutting a rabbit. Rout just past each dado. 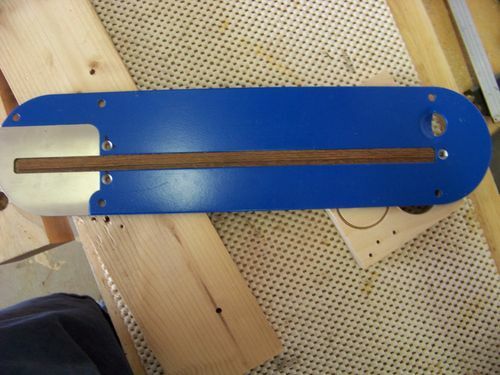 Measure the length of the slot in the throat plate and set the straightedge router guide. Again route just past each dado. The raised part remaining in the center is the plug that will fill the center of the original plate. The 1/2-inch boarder is the flange that will be underneath. Note that, to avoid any trimming of the length, you can cut the back end of the plug just a bit short. This material is going to be cut away to make room for the riving knife later anyway. Now let’s cut this plug away from the sheet of ply. Using the tablesaw and the fence cut the ZC plug away lengthwise. 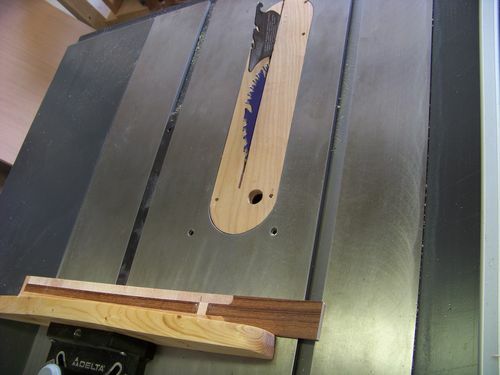 Have the blade cut just at the edge of the dado leaving the ½-inch flange. 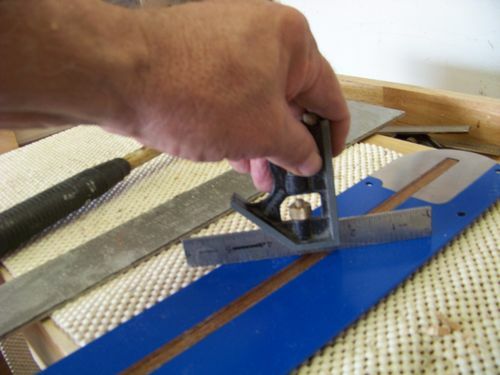 Using the miter gauge finish cutting the plug away – once again cutting just outside the dado leaving the ½-inch flange. At this point it is easier to see how this will be a ZC plug for the plate. Now test fit the plug. Unless you are really good (for me very, very lucky) the plug will be just a whisker too wide. Using a straightedge and a razor knife trim the whisker off one side and, if necessary one end. The plug should now go into the slot with slight pressure. It will not sit flush at this point. Turn the plate over and see that there is the spring steel retainer, the lifting hole bulge and a slightly raised portion around the spring steel retainer. Simply notch the corners of the plug flange to clear the retainer and the finger hole. The raised portion is a stamped relief to accommodate the chrome cover at the back of the plate. You could rout, saw, sand or file this a bit to remove the excess plug thickness in this area. I used a chisel and it took only 6 or 7 minutes to trim this area down. Yes, I know I’m slow but I got it done. Now pop the plug back into the plate. Adjust anything you need to. The top of the plug should be level with the top of the plate and the sides snug. Now we’re going to attach the plug to the plate using 3 nuts and bolts. Any small diameter ones will do. The length is not terribly critical. I used 3/4” bolts because that’s what I had laying around and they cleared everything. One person slipped on the countersink and went too deep. The 3/4” bolt hit the blade shroud. So, 3/4” is the longest you want to use. Shorter is fine. At the back end, measure in ¼ inch from the edge of the metal and ¼-inch down from the chrome plate. At the front end measure ¼-inch from the metal centered on the slot. Leave the plug in place and, with a piece of scrap wood as a backer, drill the 3 holes through the metal and the wooden flange underneath. Countersink the holes. Add the nuts and bolts and tighten. Here you do not need to add any washers or worry about the bolts/nuts loosening. Hold the nuts and tighten just until the nuts are pulled slightly into the wood. This is your “lock washer”. They won’t come loose. As you can see at this point, changing plugs, say to cut with the blade at an angle, is a job that only takes seconds. It may not be as convenient as just buying inserts, but this is much simpler than all that routing underneath to clear the adjusting screw mounts, motor and blade lock. And, there is no issue with the anti-kickback pawls. This was my first swipe at this plug design. It works well. 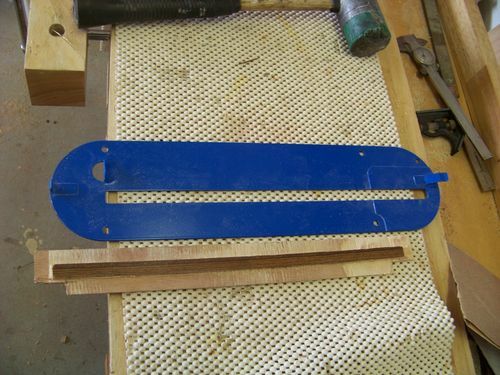 Making a rectangular jig to knock out a half-dozen at a time is certainly not a daunting task. Now lets finish this thing up. Remove the riving knife from the saw. The blade in this saw drops below the tabletop but not far enough to clear this plug underneath. It is so close that I thought of just turning on the saw and pressing down. But, I couldn’t admit to actually ever doing that could I? 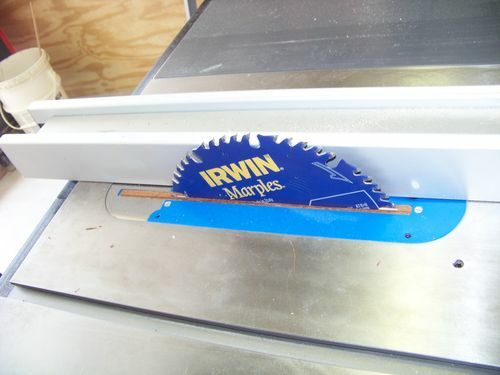 So, the correct/safe way – remove the 10-inch blade from the saw and replace it with a circle saw blade. Lower the blade and put the throat plate in. Move the fence over the plate close to – but not over – the blade and lock it down. Use a push stick to hold the plate on the other side if you feel more comfortable doing so. Turn on the saw and slowly raise the blade. You’ll hear it when it starts to cut. Keep raising the blade until it cuts through the plug and is fully raised. Turn off the saw and lower the blade. Replace the circle saw blade with your standard 10-inch blade then lower it all the way down. Put the plate back in, move/lock the fence as before and start the saw. Again raise the blade until it cuts through the plug and is fully raised. Almost there. The only thing left is to cut the slot for the riving knife. 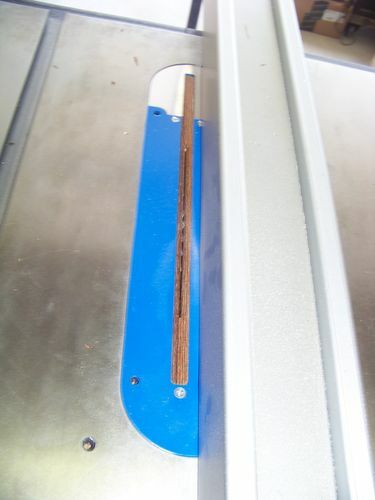 Take the plate out and extend the saw kerf all the way back to the metal plate. I used my jigsaw. Just snap out the little sliver left in the middle. This last part just takes a minute. I didn’t even bother to draw cut lines. Now the plate is ready for use. Put in the riving knife and attach the anti kickback pawls as in the pics above. Glad to see that You were able to come up with a solution and the end results looks like it will serve you well ! I have a 90’s generation unisaw and wish it had come with the riving knife feature but as it stands I just continue making my ZCI with splitters until I can eventually adopt a new system. Thanks for sharing design/build, good info! Thanks for your comments. I did the one-off with a router and a rectangular jig would be simple to make. For those of you that have a dado blade set, you could crank out a whole sheet of these. Just a series of repetative passes horizontal and verticle. Tom, any kind of plywood works fine. We had to sell our sailboat when my knees gave out. Was unsteady going forward. But I still hitch a ride now and then and help with other’s boats – especially interiors. I get good scrap that way. The only thing I would caution about is solid lumber unless it is well aged/seasoned. Plywood is steady. Thanks for your kind words but I’ve seen your work – very talented. I just wanted to come up with something that ended the ZC issues. This thing is more solid than the ZC insert I was using and with no associated problems and no back routing. Saw inserts used to be standard with screws and keyway slots anyway. Now we’re all used to pop in/out replacements. Using this method for angles or narrow dadoing is no problem. You would need a whole ZC insert for typical dado work though. But then you don’t use the anti-kickback pawls anyway. Nice work Tinman, and thanks for posting such a detailed description of how it is done. you dont leave any guesswork at all. It reminds me a lot of an 80 dollar version made from aircraft aluminum, but I like yours better. I have the Porter Cable PCB220TS contractor table saw….the one with the red throat plate that everyone loves because of the strange push in design. Although your throat plate looks a little different, this idea may work for me. Is there anyone that has tried this ZC design on my model of table saw? Thank you Tin Man for posting this idea. I do not know of anyone who has done this on any saw. I know we all like to feel like we have an original idea only to find it’s been done a thousand times before. I’m sure that is the case here. I came up with it as solutions to temporary problems with a new saw design. I must say that I like it though and plan on keeping it as my standard. It interferes with nothing in the saw and eliminates any flex in the metal saw plate. The Delta plate is a tad thicker than most but it is the design with the steel alloy and chrome insert that make it flex less than others. But there was still flex and I’m sure any ZC or dado plates Delta comes up with will flex a bit. I’ll use the oak plate I made for dado work (don’t use kickback pawls then anyway) and use these for everything else. Check out your saw for clearances underneath surrounding the saw plate. Adjust the plug as needed. I don’t see any reason it will not work. Even with a universal motor (I think that’s what your saw has) the arbor nut flange would probably be the only potential interference. Good luck. Let us know if it works. I was thinking of doing something like this for awhile but hadn’ gotten to it, I did come across an insert that Infinity makes for Sawstops that used an insert system that slid in from the side. I have a regular insert and a dado insert that came with the saw. I may look at doing this using the dado insert instead to see if the wider gap to fill makes it easier or atleast use it for doing dado-versions of this concept. Instead of drilling through the plate to use screws to fasten, I was contemplating drilling into the wooden inserts and tap in magnets so that the insert attached to the plate underside via magnets. What do you think about that idea? What I don’t like about the factory plate on this saw is how the chrome insert sits lower than the rest of the plate. When I leveled the plate, the chrome piece sits a hair lower than the cast iron table. Some might say “big deal?”, but I had a couple hang ups in the first few days of using the saw. That’s when I made my 1/2’’ mdf zero clearance plates. No more hang ups, and honestly feels a little stiffer than the factory plate. Terry, it looks like in your picture that your chrome doodad sits the same way. Have you had anything hang on the back of the throat yet? I looked at the pictures and see what you mean. No I don’t have the issues you talked about. Sometime a picture shows a thousand wrong words. What you see in the picture is really the very small gap between the plate and the table. The lighting on the blue paint vs. the cast iron plays a trick. If you look past the chrome plated/polished steel portion you see the same thing all around the plate. The plate looks lower all the way around but it’s not. It’s just an optical dilusion (yes that’s my talk and not a misspelling) of light. My plate is level with the table all the way around. I did state in my saw review that the plate had a warp/bend in it when I got it. I straightened it out and it was fine. I do not think that you are in any way incorrect. All manufacturing has tolerances. I am not at all surprised that your plate might be lower – nor would I be surprised if yours was higher. I don’t judge this saw, or any other saw, in this category/price range by the throat plate. I haven’t found ANY of them to be up to par. I limited my review to simply stating that it was bent out of the box. It was not a part of my overall judgement of the saw. All brands now use stamped out sheet steel with welded tabs. One person gets one dead-on and the next doesn’t. It’s all about tolerances. Every saw I have used, regardless of brand, has plate issues and I accept it as the current market fair and don’t judge the saw by it because no one saw is better than the other here. I know it is difficult to have this attitude after you laid out the cash to buy this saw and it’s not perfect in every way. I understand this. I can’t tell you how to feel about your hard earned cash. I can say that I feel great that my saw does not have the chronic serious issues that others might have. Don’t get me wrong, I am thrilled with this saw and have no heartburn over the transaction. I’ve come to expect manufacturing defects and/or loose tolerances these days. I also fully expect to fine tune any piece of machinery that I buy. Hopefully there are only a few plates out there like mine. Thx for posting this. I too have a 36-725 and will make one of these!! 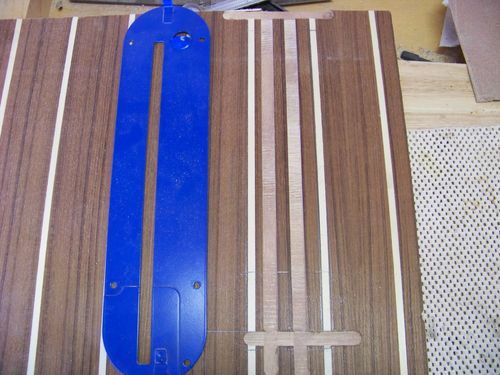 I’m still trying to figure out how to make dado insert for the saw since they still don’t make one for it. Thank you Terry and Tinman, I am in the process of moving and will undertake the project after the move. These sharing ideas have been VERY helpful, I hope I can contribute some day. In the mean time I will start with the beer. God Bless. JBorfair, the Dado insert is available from Lowe's.com now, $58 and change with sales tax (store pick-up). Kind of pricey but necessary. Wow – that is pricey. I’ll keep making mine out of wood. But, for those without a router or are Newbies building their skills, $58 may get them on their way faster.